Watch the new video from the Drive & Control Academy about the mMS 4.0 training system. In the field of mechatronics, we have developed training systems for teaching basic knowledge, through to complex systems. We generally differentiate between mobile workstations and complete workstations. The mobile workstations can be fitted with different equipment sets for different topics. The complete workstations are finished, fully functional systems. For both systems, the topic can usually be supplemented or expanded on with add-on equipment sets. Get to know the connections in mechatronics and automation technology with our training systems. The newly developed mMS mechatronics training system combines the basic technologies of mechatronics, pneumatics and hydraulics in one unit. The system consisting of 3 individual stations addresses a cube assembly, from the removal out of a rack to processing with a pressing machine, and through to the high-bay warehouse. 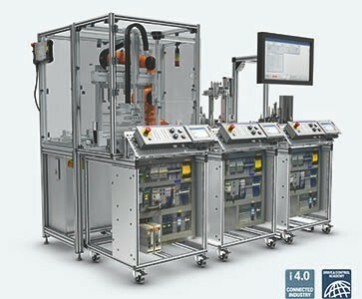 The mMS 4.0 training system – a complete Industry 4.0 system in miniature. The system addresses a real-life cube assembly, from the removal out of a rack to processing with a pressing machine, and through to storage in a high-bay warehouse. Assembled from standard components. Completely interconnected, programmable and extensively secured. Cells can be flexibly added to the system, such as a 6-axis jointed-arm robot. The entire system or individual stations are shipped fully assembled, installed, and programmed. You can get started right away. 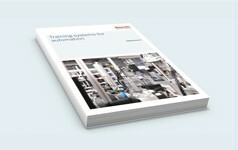 Further information on Industry 4.0 is available here.